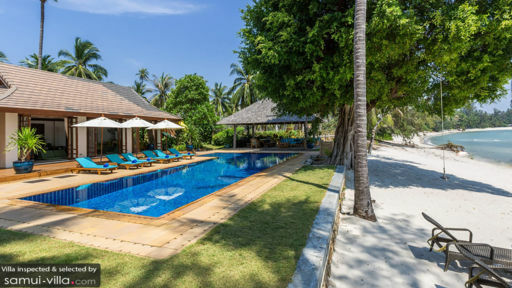 Villa Waimarie is found near the beautiful beach of Lipa Noi, Koh Samui, and comprises of luscious green landscapes, a well-decorated living space, private pool overlooking the ocean, and direct access to the beach. The stunning gardens feature ponds, exotic flowers in a wide array of colours, tulip trees, and manicured lawns. Once you traverse the pathway leading up to the villa, you will be stunned with its understated, yet abundant, natural beauty. Perfect for a holiday with friends and family, this six-bedroom retreat is the ideal place for relaxation and rejuvenation. 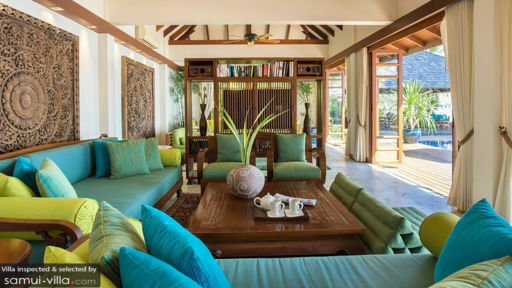 Nestled in three individual, connected bungalows are the six lavish and well-furnished bedrooms at Villa Waimarie. With two bedrooms in each bungalow, they make for comfortable and spacious living spaces where guests can unwind without a worry. One bedroom in each of the three bungalows is furnished with a king-sized bed and offers splendid view of the garden as well as a private, furnished veranda. The other three bedrooms in each bungalow are furnished with twin beds, and one with four bunk beds, perfect for a family with children. The air-conditioned bedrooms have all amenities including large wardrobes and en-suite bathrooms that have shower areas, freestanding bathtubs, and other amenities. It’s not just the outdoor yard at Villa Waimarie that you get to enjoy during your stay, it is also the endless waters of the ocean right at your feet, and the sandy beach that stretches far and wide for you to walk on. The tranquil waters and the fresh island breeze are conducive to a great holiday, where guests can not only feel at ease, but truly at home. The private swimming pool is great for a refreshing dip or to swim laps, following which you can lounge on the sun beds on the pool deck. An outdoor shaded sala is where you can enjoy an alfresco BBQ or a lavish breakfast as you enjoy the sounds of nature all around you. If you wish, you can enjoy a match of lawn tennis as there is a full-sized court hidden amidst swaying palm trees! Children can frolic outdoors on the play area complete with a slide. The meandering path that leads up to the bedrooms is a sight to behold with verdant gardens on either side and a mesmerizing variety of plants and trees. The outdoor living area or lounge comprises a dining pavilion for guests, to enjoy their meals poolside, or even beachside. There is a lounge corner with comfortable outdoor sofas and chairs to lie back on, for a cosy afternoon nap! There is a living area indoors designed with Thai interiors infused with modern comforts like a flat-screen TV, air-conditioning, etc. Enjoy a grand view of the scenery and the panoramic beauty of the outdoors as you dine in style on the indoor dining table, which is a more formal and luxurious setting. There is space enough for everyone to sit together and have a feast with their loved ones. The kitchen is a grand affair, fully-equipped with modern amenities, as well as a breakfast bar! Enjoy drinks and quick bites as you lounge on the high-chairs. The villa is fully-staffed including villa manager, chef, housekeeping, and 24-hour security. For additional services like babysitter, in-house massage, and laundry, there are additional charges. The villa offers kayaks, paddleboards, table tennis, and beach volleyball to name a few entertaining activities! 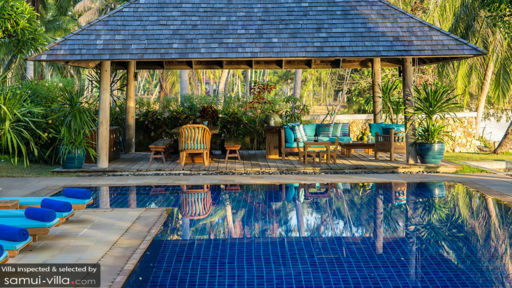 Located on the serene Lipa Noi beach, Villa Waimarie offers guests a tranquil and peaceful holiday. If you are in for some quick shopping for local fares, head to Nathon, which is merely six minutes away. The bustling area of Chaweng, a stretch of famous restaurants, bars, and cafes, is just an hour-ride away!